The 2019 All-Star Game is almost here. 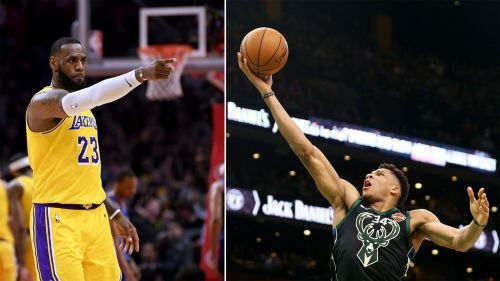 Los Angeles Lakers star LeBron James and Milwaukee Bucks forward Giannis Antetokounmpo completed the draft last week. James selected Kevin Durant with his top choice and Antetokounmpo followed by picking Stephen Curry. Three of James' first four picks were impending free agents while Antetokounmpo chose multiple first-time All-Stars. The game will be played at the Spectrum Center in Charlotte, North Carolina on Sunday. Here are some Opta numbers to know about the matchup. Team LeBron: Kevin Durant, Kyrie Irving, Kawhi Leonard, James Harden, Anthony Davis, Klay Thompson, Damian Lillard, Ben Simmons, LaMarcus Aldridge, Karl-Anthony Towns, Bradley Beal, Dwyane Wade. Team Giannis: Stephen Curry, Joel Embiid, Paul George, Kemba Walker, Khris Middleton, Nikola Jokic, Russell Westbrook, Blake Griffin, D'Angelo Russell, Nikola Vucevic, Kyle Lowry, Dirk Nowitzki. #BlakeGriffin on @NBAAllStar: "I'm going to have a good time and represent us well." – James will be playing in his 15th All-Star game. He will tie Kobe Bryant and former San Antonio Spurs star Tim Duncan for the second most appearances in NBA history. – James will enter Sunday's contest with 343 All-Star game points. That is already the most by any player. He also holds the record for most field goals made and attempted. – Dwyane Wade needs three steals to become just the fourth player ever to tally 30 or more in their All-Star careers. Bryant, Michael Jordan and Isiah Thomas are the only three others to reach that mark. – The players with the top six individual scoring averages in All-Star history will appear in the game on Sunday. They are: James (24.5), New Orleans Pelicans forward Davis (24.5), Oklahoma City Thunder guard Westbrook (24.4), Golden State Warriors forward Durant (24.3), Detroit Pistons forward Griffin (21.8) and Thunder forward George (20.8). – James was also a captain in last year's game, which was the first that did not feature the East against West format. He scored 29 points to lead his squad to a 148-145 victory over Team Curry. The 293 combined points were the fewest since the 2013 game. – Warriors sharpshooter Curry has made just 33.9 per cent of his three-point attempts in All-Star games. Celtics guard Irving is fourth all-time in that category at 48.4 per cent.